Hidden in the heart of London’s fashionable Islington, the London Art House offers a wide variety of creative spaces available to hire, as meeting rooms, for bespoke corporate events or conferences. A conference, training day or meeting, in any of the beautifully decorated spaces will transform your event and make for a memorable, productive, creative experience that your guests will talk about for days. Easily accessible and truly special, you will know your venue choice was right as soon as you step through the door to the London Art House. Manor Garden Hall: The Manor Garden Hall is the largest event room at the London Art House. It’s equipped with an extensive audio-visual system. The large size of the room allows for a variety of seating styles for conferences, training events and networking’s. The Rococo Room and Tadema Terrace are the private catering and reception areas for the Manor Garden Hall. Capacity: Theatre 280 – Cabaret 150 – Reception 300 – Boardroom 88. 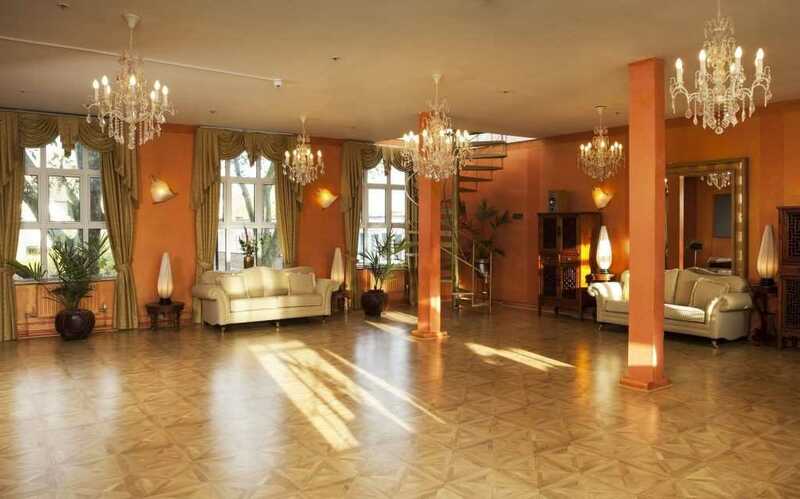 Rococo Room: Light, grace and elegance are the main characteristics of the Rococo room. 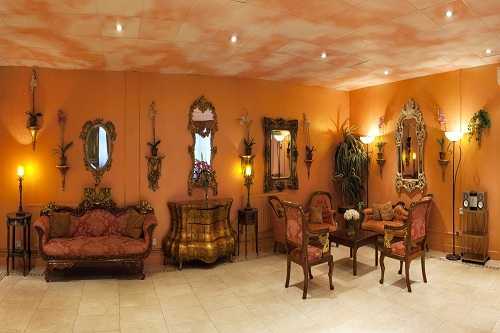 Ornate mirrors and chaise longue edge the space of this meeting room. 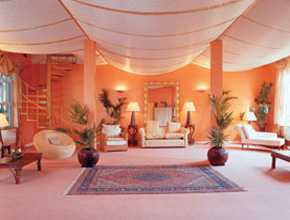 The use of gold leaf in combination with shades of terracotta give this room a sense of exquisite warmth and luxury. 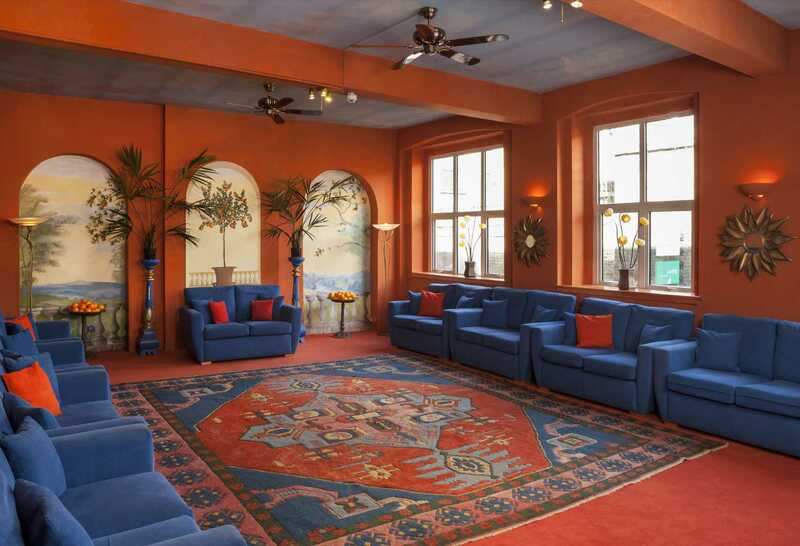 The neighbouring Tadema Terrace is the standard refreshment and catering area for this room. Please contact us if you would like a private refreshment and catering space. 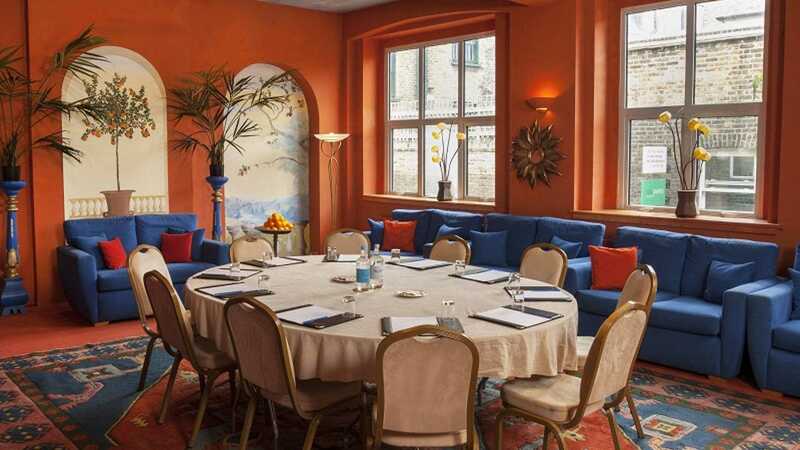 Capacity: Theatre 60 – Cabaret 40 – Reception 70 – Boardroom 28 – U-shape 30 Egyptian & Lord Leighton Lounge: The Egyptian Room is edged with a Nile view mural, Egyptian fabrics and authentic accessories, with comfortable low sofas, which are ideal for informal meetings. For more formal sessions a variety of table styles can be provided. The neighbouring Lord Leighton Lounge makes the perfect break room for Tea, Coffee and Lunch. Capacity: Theatre 30 – Cabaret 24 – Reception 45 – Boardroom 15 – Informal 20 Baroque Hall, Art Studio & Monet Café: The Baroque Hall is a flexible space and can accommodate a variety of seating styles. This meeting room has rich gold fabrics and large sofas. Sunlight floods into this very popular room through the large windows on both sides. A spiral staircase in the corner of the Baroque Hall leads to the private syndicate room called the Art Studio. It is a very light and airy space complimented by treetop views. This area is excellent for creative sessions and is adjoined by a comfortable seating space ideal for group discussions. The Monet with Flamingos is the catering area for the Baroque Hall. For larger events we suggest using the Egyptian Room. Capacity: Theatre 60 – Cabaret 40 – Reception 60 – Open Square Boardroom 32 – U-Shape 24 Bauhaus Room: A fabulous room for board meetings and brainstorming sessions with comfy sofas. The recently refurbished Bauhaus Room is minimalistic and inspiring at the same time. Cool greys and hot pinks provide a chic, clean and comfortable space to move around in. Capacity: Theatre 20 – Cabaret 12 – Reception 25 – Boardroom 12 – Informal 16 Picasso Room: The Picasso Lounge is ideal for team away days and training. The Picasso Lounge creates a sumptuous environment for relaxing discussions. Adjoining the space is the Picasso Catering area; a perfect spot for breaks in the day of the event. 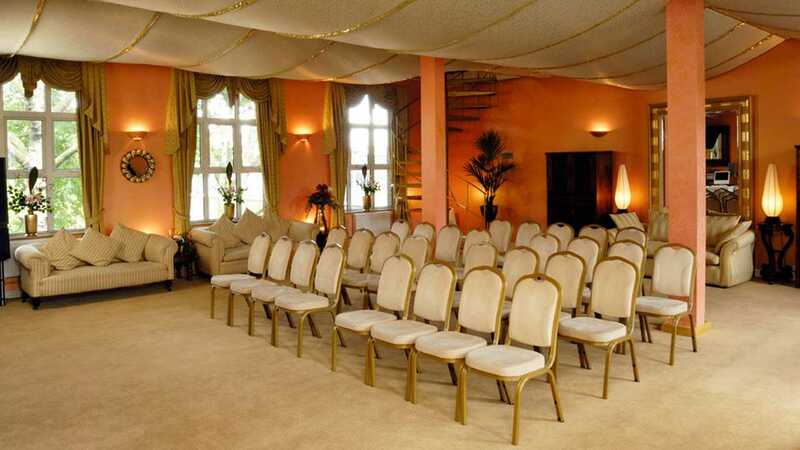 Capacity: Theatre 32 – Cabaret 18 – Reception 30 – Boardroom 20 – U-Shape 16 The Orangery, Redon & Marble Garden: The comfortable blue sofas are ideal for informal seating styles. Tables can be brought in for more formal setups if required. Large windows infuse the Orangery with natural daylight, which boosts the energising colours. 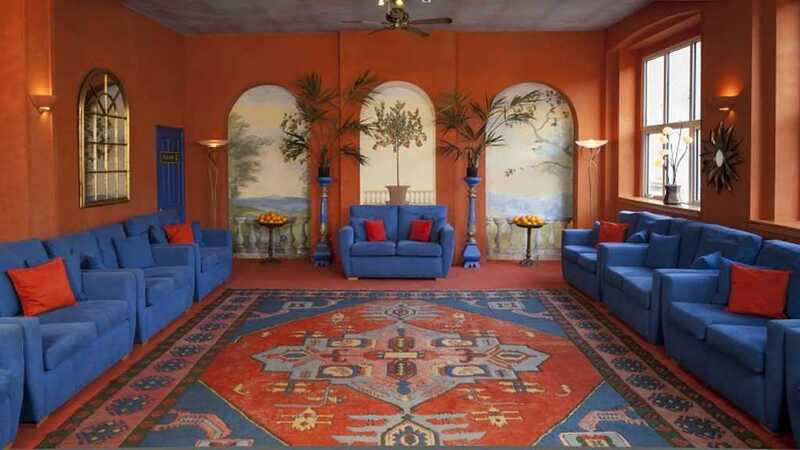 The rich blues and oranges erase negative feelings to create an inspirational setting for your guests. The Marble Garden adjoins the Orangery which creates an exquisite reception, refreshment and catering space. Adjoining the Orangery and the Marble Garden is the Redon Room, inspired by the work of Odilon Redon. The vibrant colours of orange, creates a lively and cheerful atmosphere. A perfect room for private meetings away from your event. Capacity: Theatre 42 – Cabaret 24 – Reception 50 – Boardroom 24 – Informal 18 Spaces are available for evening hire. Minimum Hire: 4 hours. Evening and Sunday hire will endure a staff cost on top of advertised costs. Please contact us with any queries you may have. Full Day From £250.00DDR From £51.00Please Note Venue pricing can vry greatly depending on factors such as event date and timings.